This time of summer the Atlantic Harpoon swordfish are in season. New England fishermen call it “harpoon” season. The fisherman, or “strikers,” head out to the Western Atlantic Ocean in small fishing boats and actually hunt the ocean surface for the swordfish. When one is spotted near the surface the striker harpoons the big fish by hand. A fish caught this way can range from 150 to 600 pounds. A striker goes after a Swordfish on a calm day. Each day the daily catch is brought in and sold to local markets, and the Swordfish steaks usually end up on someone’s plate in less than 24 hours, creating an incredible New England seafood experience for enlightened connoisseurs. The practice of harpooning swordfish predates industrial scale fishing or “long line fishing” where thousands of baited hooks hang on floated lines that can be more than 30 miles long. The long-line hooks do not discriminate between the type and size of fish caught and experts say the practice in the past has depleted swordfish stocks in some places. International laws are now in place now to limit the catch of the long lines, and these fishermen are closely monitored. Harpoon swordfish hunters, or “strikers,” take their catch at a much slower, more selective rate. The strikers only go after the large fish that are well past breeding age and avoid baby swordfish in the breeding grounds. The fish are then delivered fresh daily to markets and restaurants in New England. The selective practice presents no threat to swordfish stocks. While swordfish are found worldwide they are only in season in New England during the summer when the water is warmer. According to research, the big fish tend to congregate where ocean waters have sharp temperature breaks (above 58°F) and where strong ocean currents meet. This creates a turbulent environment where there is abundant food. Along with the strikers, sport fishermen also ply these waters with rod and tackle seeking the big Swordfish. Whether broiled, baked, grilled or on a kabob, fresh from the ocean swordfish is a favorite of first-time seafood initiates as well as seafood connoisseurs. Swordfish has a meaty texture and mild flavor. Swordfish also offers a low-fat, low-calorie healthy choice for all seafood lovers. Fresh swordfish is also rich in omega-3 fatty acids and other vitamins and minerals that are good for the heart. The most popular fresh summer swordfish recipe is also the simplest. Marinated and grilled. Here is a great recipe for a one-pound, 1 ½ -inch thick fresh swordfish steak. fresh ground pepper to taste. If desired, a dash of fresh lime or lemon juice may be added. Coat the steak and let marinate for one to two hours. Cook on a medium-high grill for four minutes on each side, or until firm to the touch. Only flip the steak once. Do not overcook as the swordfish will get dry very quickly. Remove from the grill and let stand for one minute before partitioning. Leave the skin on when grilling to help keep the fish moist but remove to partition and serve. Today fresh Atlantic swordfish can be shipped overnight by a Cape Cod online seafood retailer anywhere in the United States. This means anyone – from Florida to Kansas – can enjoy delicious swordfish that only 24 hours earlier were swimming in the clean, crisp ocean waters off Cape Cod. Every year Henry Johnson would take his mother out for a Mothers Day lobster dinner. But this year, Mom is retired and living 1300 miles away in Naples,Florida. Getting together on Mother’s Day was not going to be possible. Johnson said he needed a way to keep the Mothers Day lobster-dinner tradition going. So Johnson went online to see if he could find a seafood restaurant in Naples offering gift certificates. But knowing his mother, Lillian Johnson, was a lobster gourmet, he was not sure he could find a restaurant offering the jumbo lobster his mother preferred. The web search for a lobster-dinner gift certificate delivered a surprising result, according to Johnson. His Google page yielded a Cape Cod, Massachusetts Lobster delivery service that offered to send fresh, live Maine Lobster overnight to Naples, Florida. And not just any lobster, but jumbo Maine Lobster. The delivery service – Lobsters-Online.Com — also offered freshly harvested steamer clams and oysters. Johnson said he was “thrilled” with the idea of sending his seafood loving mother a box of live Maine lobster on Mother’s Day. After a few minutes of shopping the web site, Johnson selected two four-pound lobsters, a bushel of steamers and the Lobster Trap Co. homemade style Lobster Bisque. The Lobsters-Online.Com service offered a satisfaction guarantee, which was important to Johnson. Johnson said his mother is one of those Lobster aficionados who grew up in Maine, went to school in Boston and raised a family in Connecticut. His mother’s only complaint about Florida has been that it is difficult to obtain locally fresh New England Lobster and shellfish. Sending live lobster on Mother’s Day, Johnson said, will go a long way toward keeping their Mother’s Day lobster dinner tradition going. Lobsters-Online.Com has been serving up Mother’s Day lobster gift boxes for more than a decade. Every lobster gift box includes only select-grade lobster fresh from the clean, crisp waters of New England. The lobsters are placed in boxes with special individual compartments to protect them in transit. The special box is placed inside a frozen-gel packed cooler and layered with wet seaweed. The package is then shipped FedEx overnight delivery to ensure the lobster arrives fresh, alive and healthy. Lobster gift boxes may be ordered by 2:30 p.m. EST for next day delivery. Delivery is available Tuesday through Saturday. Calvin the rare calico lobster was saved from a Cambridge, MA Restaurant lobster pot this week after the chef took notice of the lobster’s yellow and orange spotted shell. Instead of serving him up, they decided to name the guy and put him safely aside. A calico lobster is exceedingly rare, about 1 in 30 million. The 1.5 pound lobster, dabbled in yellow, was found at Jasper White’s Summer Shack Restaurant in Cambridge when they were cleaning out a 1,200 gallon lobster tank. It is believed to have been caught off Winter Harbor, ME. How it escaped notice before this is anyone’s guess. White estimates the rare lobster had been touched at least four times by human hands prior to being rescued. Normally all the lobster in the tank end up on a dinner plate. Jasper said he buys about 350,000 pounds of lobster annually for his restaurants. The lucky lobster’s calico shell is caused by the inconsistent distribution of the pigment layers that usually combine to make uncooked lobsters look brown. Lobsters come in many colors, including brown, orange, blue and white — the most rare. Still a calico lobster is exceedingly rare. Calvin was sent from the restaurant to the New England Aquarium in Boston for safe keeping. “We say that yellow lobsters are about one in 30 million,” said Michael Tlusty, the director of research at the New England Aquarium. Eventually the lobster will head to the Biomes Marine Biology Center in North Kingstown, R.I., where he will be displayed for school field trips and other educational purposes. We now know what a lobster does inside a lobster trap, thanks to “The Lobster Trap Cam” in Halifax harbor. The live lobster trap web cam was recently placed inside a lobster trap in the popular Nova Scotia fishing town so the curious could go online and watch. The cam shows the lobster that wander into the trap to have a free meal on the bait and then can’t get out. Today on the Lobster Trap Cam the lobster in the trap is quite active, facing the camera, snapping the big crusher claw, and pressing itself into a corner. A large crab moves threateningly from the side of the trap and amazingly, appears to be going after the bigger lobster until the crab decides to leave. The remarkably clear Canadian harbor water gives web visitors an unusual view of life at the bottom. Fish, urchins and starfish can be seen passing through the trap. 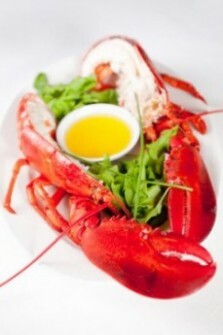 The picture refreshes every two seconds, with the visiting lobster in the starring role. A live lobster appears on a web cam on the bottom of Halifax harbor. The cam is jointly operated by Murphy’s On the Water and Nova Scotia Webcams. Murphy’s is a Halifax restaurant and tour boat operator. They report that the Lobster Trap Cam is going viral with more than 65,000 hits. While the lobster in the trap may be a star, the truth is, there is little chance that this particular lobster will end up in a hot pot. A spokesman for the webcam said the lobster are pulled up in the trap and released after “three or four days.” So while this one will get away, rest assured there are plenty more lobster where this one came from, and many of those lobsters will end up on a stove. Much of the lobster eaten in the UScomes from Canada. In fact, the lobster industry is just as important to the Nova Scotia economy as it is to the Maine economy. It has been no secret that lobster fishermen this year are again hoping for a record catch. According to state of Maine government data collected from the fishermen, landings were weak in the spring due to the cold weather but now appear to be catching up. Maine lobstermen landed a record 94.7 million pounds in 2010 so that is the mark to beat in 2011. While the curious may watch the Lobster Trap Cam, September is a busy time for the lobster industry, with the Labor Day Holiday setting the pace for increased demand. This time of year, “Shedders,” or soft-shell lobster, are popular with local folks in Maine and Massachusetts. Hard Shell lobster is stronger than soft shell lobster and lives longer out of water so they can be shipped further. Live lobsters can also be shipped right to people’s homes anywhere in the US thanks to an online lobster service. Now, thanks to the Lobster Trap Cam and home lobster delivery, a family sitting at a dinner table in Kansascan enjoy a meal of fresh Maine lobster while watching the lobster’s cousin cavort on the web for Lobster Trap Cam. With July temperatures warming up the Maine seacoast, lobsters are once again in their lively season making them easier to catch and the daily haul more plentiful, resulting in new low summer-season lobster prices. That is because the more the lobster moves around in the beautiful Atlantic Ocean; the more likely they are to stop by to investigate some fisherman’s lobster trap. This also means it is more likely the lobster will also end up as the guest-of-honor in someone’s lobster pot. And how cool is it that this good news of new low prices comes right at the best time of year for outdoor entertaining. Now backyard lobster chefs everywhere can all look like heroes without breaking the budget. Lobster Clambake at low Summertime prices. Lobsters are lethargic in colder water but as the summer sun warms up the coastal waters they begin to become more active. This time of year the lobster are busy hunting for new food sources, looking for new homes to hide in and on the lookout to mate. A tasty free meal in a fisherman’s trap is often too hard for a busy lobster to resist. All along the Maine and Massachusetts seacoast, locals and tourists are enjoying lobster dinners at low seasonal prices. For lobster lovers who can’t get to Maine, don’t worry. There is a Cape Cod lobster service that will ship fresh, live lobster right off the boat direct to the consumer anywhere in the country. Today seafood lovers can order fresh lobster, clams, oysters, scallops, fish and all the best seafood New England has to offer and have it shipped overnight direct to their front door. This month lobster prices are 15-to-20 percent less than just a month ago. For example, a hard to find four-pound live lobster can be ordered on the web at Lobsters-Online.Com for $44 plus shipping. For many people, now is the time to take advantage of summer prices and plan that family lobster clambake. Some folks even have lobster shipped to their favorite vacation destination. Indeed, summer is the time to celebrate lobster as often as possible. All the signs are in place for another record Maine lobster catch. According to a report from the Maine Department of Marine Resources (DMR), more than 93 million pounds of lobster were caught in Maine’s waters during 2010. This giant catch represents an estimated increase of 12 million pounds of lobster from the previous 2009 record of 81 million pounds. So here’s to another good season, and plenty of good eating.